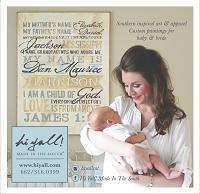 Our Baby Love paintings are handpainted on gallery canvas. Our paintings make the perfect addition to your child's nursery. We have four standard sizes available. We can also build any size to fit your space. We love when clients send us photos of their nursery. We will customize the colors to coordinate with your other design elements. Deposit paid here. Balance and Shipping rates will be finalized upon completion. My mother's name is . My father's name is . My first home is . I have grandparents who adore me.